Yuchengco Museum continues its Rizal Lecture Series this September that will explore a different side of Jose Rizal. This will include topics like controversial facts about the National Hero, and on Rizal's dreams and their meaning. Lectures will be held on September 17 & 24 (Saturdays) at 3-5pm. 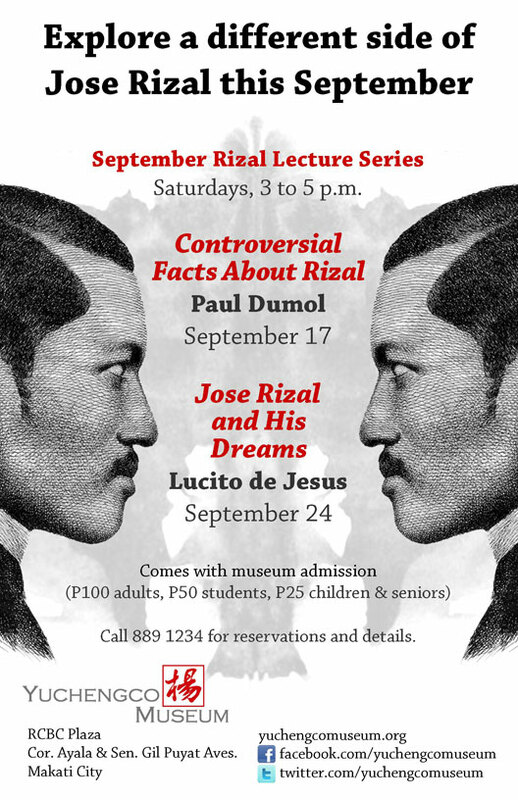 Professor and playwright Paul Dumol--who spoke on Rizal and Nationhood last August--returns to share little-known or controversial facts about Jose Rizal. Aside from teaching at the Department of History at the University of Asia and the Pacific, Paul Dumol is a playwright best known for his work, Ang Paglilitis ni Mang Serapio. His plays have been exceedingly on historical subjects, particularly Philippine heroes of the end of the 19th century. Dream counselor and psychotherapist Lucito de Jesus will explore and decipher the dreams Rizal recorded in his letters and diaries, and what these say about Rizal's psyche. De Jesus will also look into how these dreams guided Rizal in his life and personal development. Lucito de Jesus is a recognized dream specialist and author of two books, Dreamwork: Values and Practices in the Philippines and Reading Dreams: Relationships. He hosts Dreamdate, a regular weekly radio program on DZSR Sports Radio 918. The Rizal Lecture Series is one of the highlights of the RIZALizing the Future exhibit at Yuchengco Museum, on view from June 3-October 29, 2011. Both lectures come with museum admission (P100 for adults, P50 for students, and P25 for children and senior citizens). Advance registration is recommended. To register, call (632) 889-1234 or email info@yuchengcomuseum.org. Yuchengco Museum is located at RCBC Plaza, Corner Ayala and Sen. Gil J. Puyat Avenues, Makati City.